I have to admit that I was a little late to the game when it came to Firefox. I downloaded the free web browser late last year after hearing good things about it from my roommates. I used to think that all browsers were pretty much the same, but I changed my mind when I saw how the program could be customized using "add-ons," specialized plug-ins that are easily installed. The add-on that has impacted my work flow the most has been Cooliris, a media plug-in that makes searching for images about as easy as possible. I spend a good portion of my time searching on-line for reference photos (anything from cars to weapons to clouds). Now, instead of clicking through dozens of pages on Google and Flickr, I can simply click on the icon, transforming my screen into a scrolling wall of images (and even video) that is easy to navigate, not to mention extremely fast. You can even search directly from the plug-in, choosing from the many sites that are Cooliris enabled. One of my favorite features is the "share" button, a small envelope that, once clicked, adds the selected photo to an e-mail. Once all the photos are attached, I send it to myself. The subsequent e-mail provides me with a link to a custom page where all the images are displayed and easily downloaded. Finally, there is FireFTP, a no-nonsense program that turns your browser into a FTP window, making file transfer easier (and faster) than ever. Now I don't have to open up Dreamweaver every time I want to upload documents to Marvel or my web site. Just a reminder, Identification Day is tomorrow. I'll be answering questions and drawing up a storm (although not taking commissions). 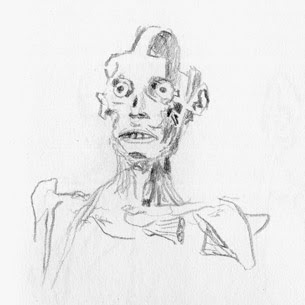 And just for fun, here's a sketch from my 2004 trip to see Body Worlds in LA. Have a great weekend! I'll have to play around with this photo search add on, thanks, man! Ok, I just downloaded it and tried it out. I think my life just became one point easier. amazing. Thank you, sir. Glad I could help, Eric. I'm also planning a post on search term strategies, which can save time as well. Thanks, kingcoyote! All the Google sites are Cooliris enabled, including blogspot. It's a pretty easy way to see everyone's pics with minimal effort. Cooliris's animated thumbnails are a bit annoying to me when I'm looking for static images. Bing.com has a decent image search feature too. I've found that Flickr offers more variety in images since it is mostly non-pro photos, so in general it's not the same ones over and over that you often get with a web wide search. Michael, I haven't seen the animated thumbnails that you're talking about, but I'll have to check out bing. I saw tons of their commercials when I was last in FL (where they have TV). And I know what you mean about Flickr. I'm going to do a whole post on my search strategies and how it depends on what I'm looking for.